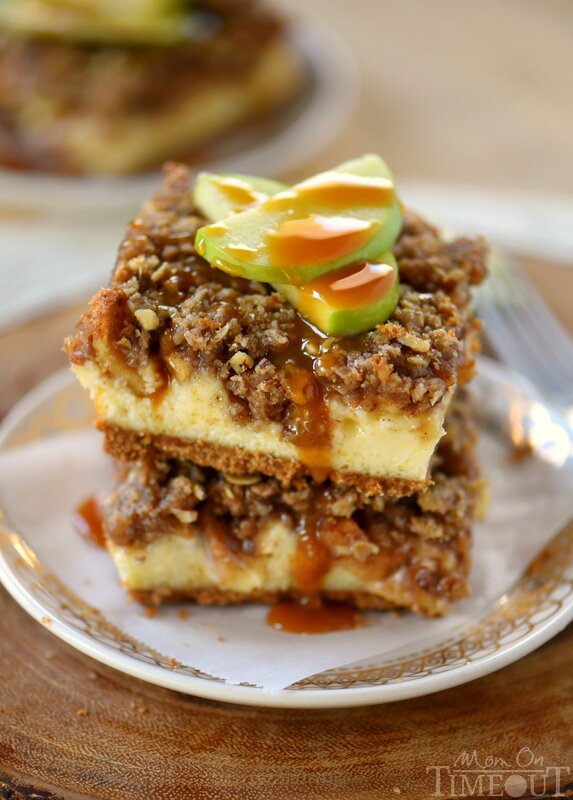 Apple season has arrived and to celebrate, I’m sharing these outrageous Dutch Apple Pie Cheesecake Bars! A graham cracker crust spiced with cinnamon, a decadent vanilla bean cheesecake layer, apples tossed in sugar, cinnamon, and nutmeg and finally my favorite streusel topping. Yeah, WOW. 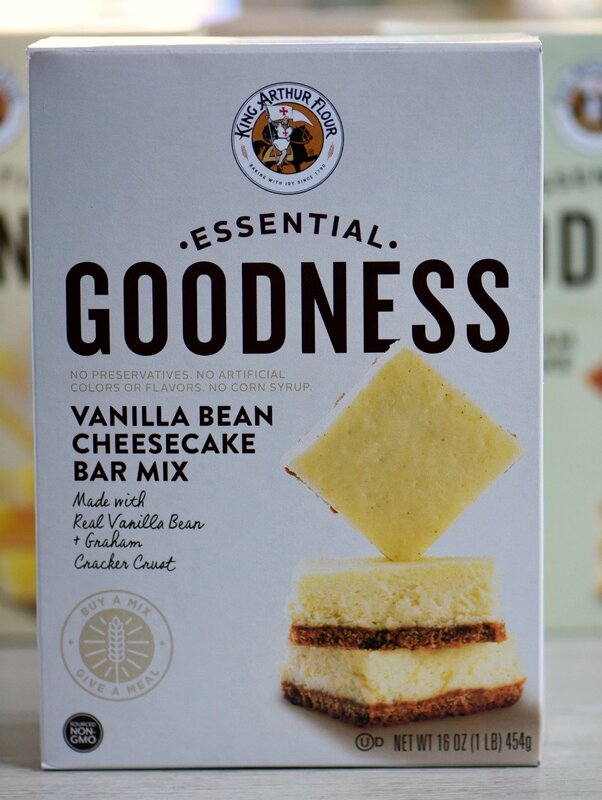 I recently had the chance to try a variety of the new King Arthur Flour’s Essential Goodness Mixes, and the Vanilla Bean Cheesecake Bar Mix really stood out to me. 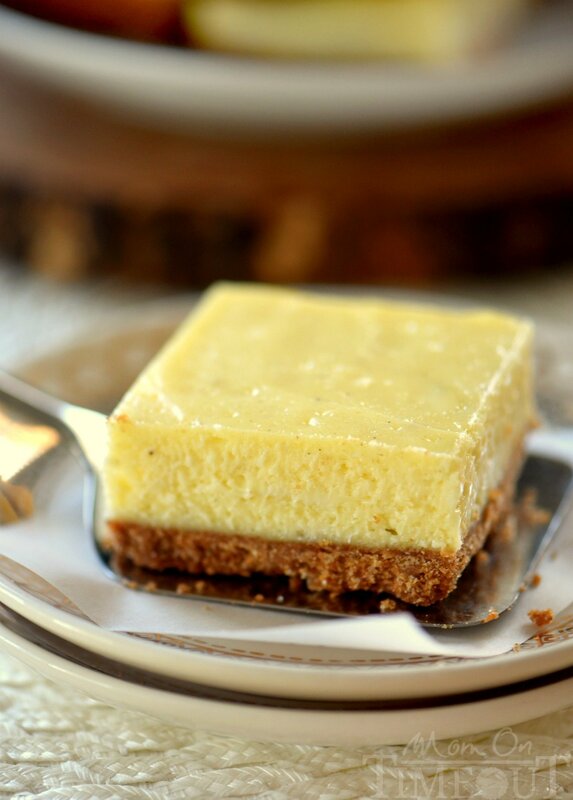 On it’s own, the cheesecake bars are both easy to make and entirely sophisticated. I realized instantly that the mix would be a terrific building block for a more creative recipe. The graham cracker crust featured an ingredient that jumped out at me: cinnamon. I’ve always been a fan of shortcuts – as long as they don’t compromise the end result. I knew with certainty that this new line of products from King Arthur Flour was going to be amazing, and I was right. Essential Goodness mixes are made with simple ingredients – like the kind you use when baking from scratch. No artificial colors or flavors, no hydrogenated oils, no preservatives,no corn syrup and all mixes are sourced non-GMO. One of the great things about these mixes is that they are delicious on their own but are also perfect if you like to mix things up a bit, like I did with these cheesecake bars. You can get more great ideas, baker’s tips, and twists to make a fun, creative version of the original at KingArthurFlour.com. As an added bonus, every time you buy a mix, you give a meal. For every mix purchased, King Arthur Flour donates the cost of a meal to Feeding America, the nation’s largest organization dedicated to fighting domestic hunger. There is no limit or end date to the campaign, and King Arthur commits to donating a minimum of one million meals in the first year of sales. I think you’re going to love all the variety in this new line of baking mixes. Essential Goodness offers unexpected spins on classic breakfast and dessert items. 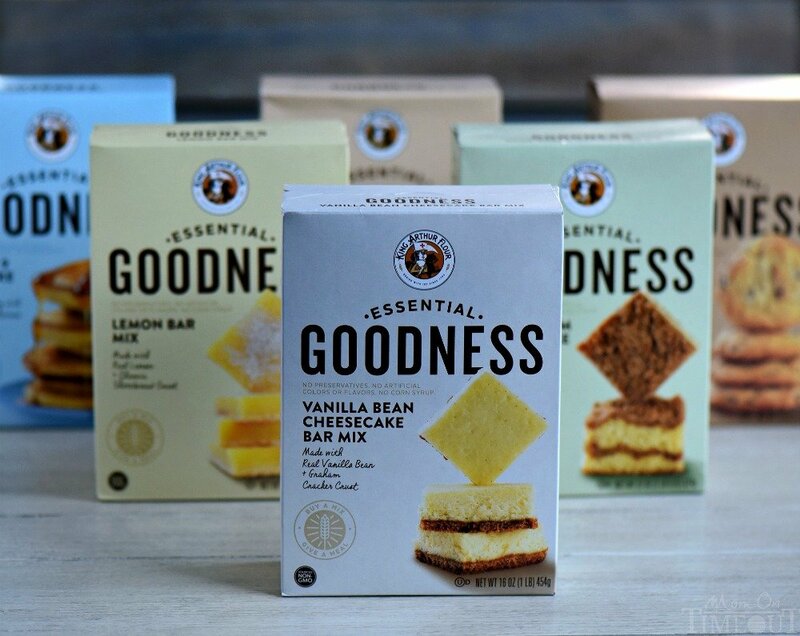 Make sure to try all the Essential Goodness Mixes: Sour Cream Coffee Cake, Lemon Bars, Chocolate Chip Cookies, Cloud 9 Pancakes, Cinnamon Sugar Puff Muffin Mix and, of course, the Vanilla Bean Cheesecake Bars. I do hope you’ll give not only this recipe a try, but all the delicious varieties of Essential Goodness that are available! 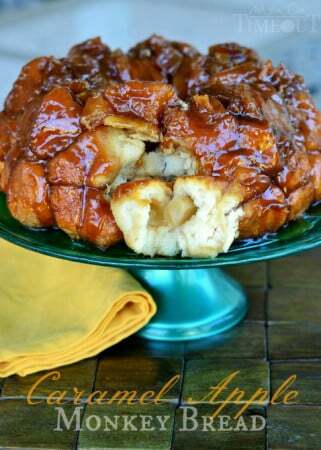 I’m planning on baking my way through the whole line this Fall. Happy baking! 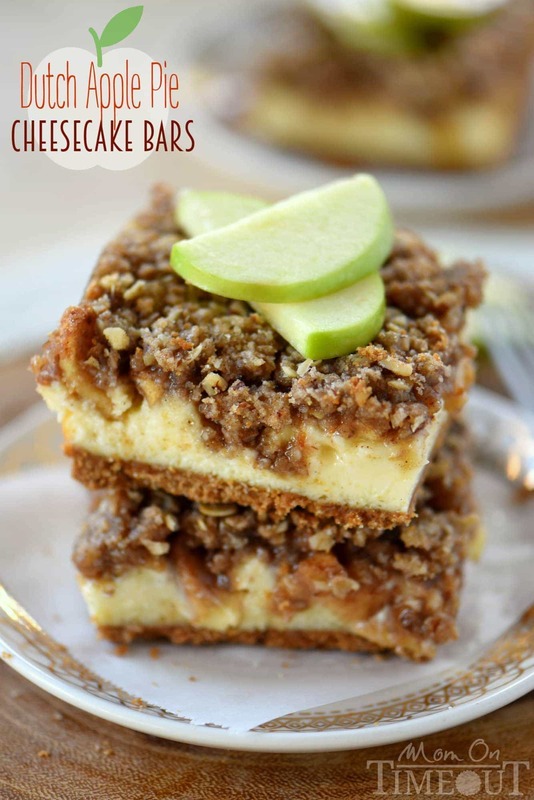 Apple season has arrived and to celebrate, I'm sharing these outrageous Dutch Apple Pie Cheesecake Bars! 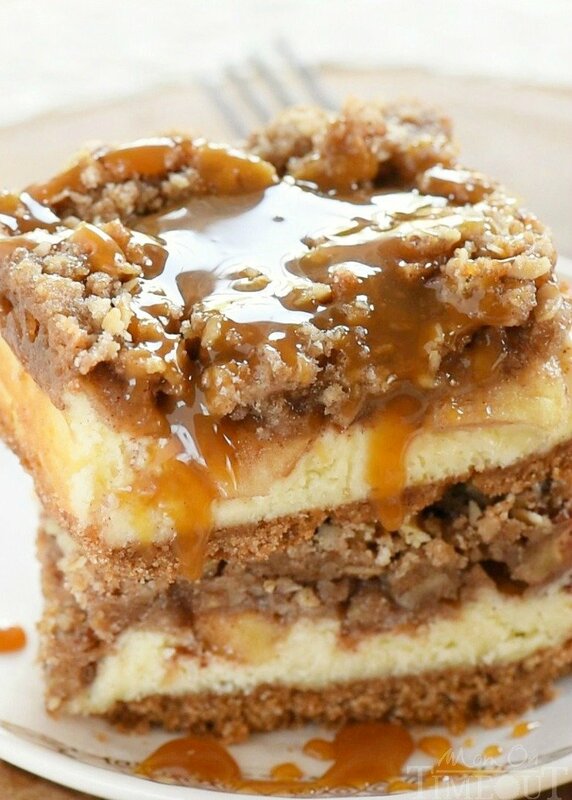 A graham cracker crust spiced with cinnamon, a decadent vanilla bean cheesecake layer, apples tossed in sugar, cinnamon, and nutmeg and finally my favorite streusel topping. Yeah, WOW. LIghtly grease a 9-inch square pan. Line with parchment paper(optional). Combine the melted butter and crust mix in a small bowl and stir untill uniform. Press the crumbs into the bottom of the prepared pan forming an even layer. Bake for 14 minuutes. Remove from oven when done. Beat cream cheese and filling mix until smooth. Add eggs, one a time, mixing until combined. Scrape down mixing bowl as needed. Pour the cheesecake over the hot crust. 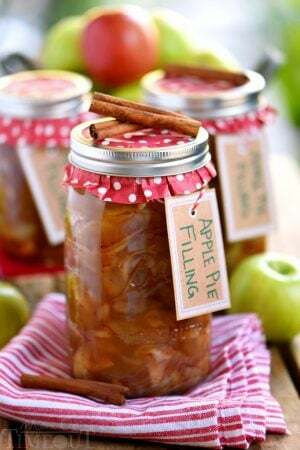 Toss chopped apples with sugar, cinnamon and nutmeg in a medium size bowl. Make sure apples are thoroughly coated. Evenly spoon the apples on top of the cheesecake layer. Add all of the streusel ingredients into a food processor and pulse until the largest pieces are the size of a pea or smaller. Carefully spread the streusel layer over the top of the apples making sure it gets in and around the apple pie layer. Let bars cool at room temperature for one hour. 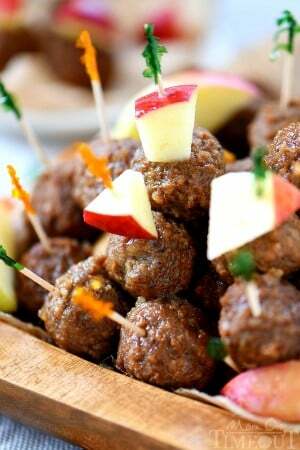 Transfer to the refrigerator and chill for at least 3 hours (or overnight) before cutting squares and serving. 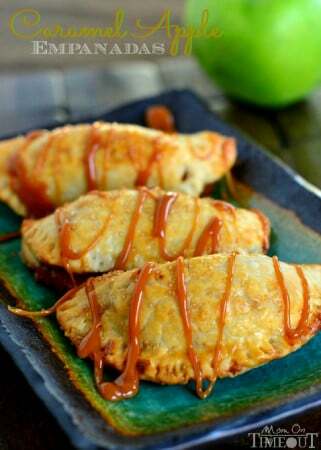 Top with caramel sauce if desired. 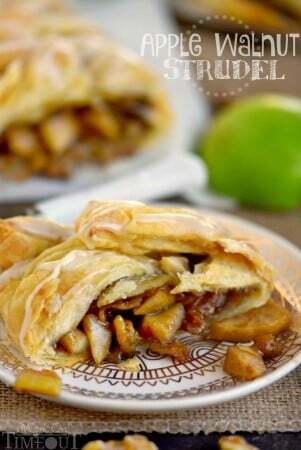 More yummy apple recipes for the season! Disclosure: King Arthur Flour has provided me with the products used within this project. I was compensated for this blog post. Thank you for supporting the brands that make Mom On Timeout possible! I was wondering if the recipe was correct when it says it makes 16 bars. It doesn’t seem like a 9-inch pan would make 16 servings unless they were one bite size. Is the pan size correct? Or is the serving size wrong? Thank you. That’s 16 2 x2 inch bars. Actually a little larger than that 🙂 It’s correct as is. Can I use another size pan for this recipe? It seems like a lot of apples and streusel topping for just a 9 inch square pan. Has any one had any problems making this? I like a lot of apples and streusel 🙂 Feel free to scale back if you’d like. The cheese cake mix won’t spread.. 🙁 do I need to add milk to it like it says on the box recipe? Nope. Just the cream cheese and eggs! THANK YOU TRISH! I found the mix at Target, Whole Foods and Mollie Stone’s. Great tip, they’re terrific! Wonderful Florene! I’ve tried several now and they are all SO good!